Onslow County, North Carolina, U.S.
Aldis Alexander Basil Hodge (born September 20, 1986) is an American actor. Hodge is best known for his portrayal of Alec Hardison on the TNT series Leverage and MC Ren in the 2015 biopic Straight Outta Compton. Hodge was born on September 20, 1986, in Onslow County, North Carolina. Both of his parents, Aldis Basil Hodge and Yolette Evangeline Richardson, served in the U.S. Marine Corps. Hodge's mother is from Florida, while his father is originally from Dominica. Aldis is the younger brother of actor Edwin Hodge. Hodge played both the clarinet and the violin as a child, but as an adult, his focus is on the violin; he purchased his first at the age of 18. In addition to acting, Hodge designs watches, writes, and paints. In 2007, Hodge was awarded the role of Alec Hardison on the day of his 21st birthday. In 2010, he received a Saturn Award nomination for Best Supporting Actor in Television for this role on Leverage. The win went to Aaron Paul of AMC's Breaking Bad. 1997 Between Brothers Reggie Episode: "Family Affair"
1998 NYPD Blue Eddy Episode: "Weaver of Hate"
1999 Buffy the Vampire Slayer Masked Teen Episode: "Fear Itself"
2000 Judging Amy Lester Clancy Episode: "Zero Tolerance"
2001 Becker Graduate #1 Episode: "2001½: A Graduation Odyssey"
2002 Boston Public Andre Episode: "Chapter Thirty-Seven"
Charmed Trey Episode: "Long Live the Queen"
2003 ER Young Man Episode: "The Lost"
Cold Case Young Mason Tucker Episode: "The Runner"
The Game Derwin Davis Episode: "Pilot"
Numb3rs Travis Grant Episode: "The OG"
Bones Jimmy Merton Episode: "The Soldier on the Grave"
Standoff Nathan Hall Episode: "The Kids in the Hall"
2009 Castle Azi Episode: "Always Buy Retail"
The Forgotten Danny Rowe Episode: "Prisoner Jane"
2010 Mad Usher / Sinestro / Frog (voice) Episode: "WALL-E-NATOR/Extreme Renovation: House Edition - Superman's Fortress of Solitude"
Private Practice Esau Ajawke Episode: "Fear of Flying"
The Chicago Code Deon Luckett Episode: "St. Valentines Day Massacre"
2011 CSI: Miami Isaiah Stiles Episode: "Sinner Takes All"
2014 The Walking Dead Mike Episode: "After"
↑ . (July 30, 2010). "aldis-hodge.com". Accessed 2010-09-20. ↑ The Weekend of Awesome aka Supernatural LA 2009 - Friday (April 21, 2009). "Whedonopolis". Accessed 2010-09-20. ↑ Leverage ConCon The Guys Panel posted by supershinygirl. (March 24, 2010). "youtube.com". Accessed 2010-04-08. ↑ 'Hmm Awards-Aldis Hodge Complete Interview' by JD247 (November 22, 2009) Youtube.com. Accessed 2010-02-09. 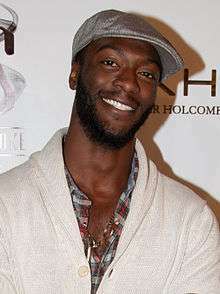 ↑ 'Interview: Aldis Hodge from Leverage' by Emma (December 5, 2008) Fanbolt.com. Accessed 2010-02-09. ↑ 'Leverage Interview II: Talking with Dean Devlin' by Joseph Dilworth, Jr. (December 11, 2008) Pop Culture Zoo. Accessed 2010-02-09. ↑ 'Nominations for the 36th Annual Saturn Awards' (2010) The Academy of Science Fiction Fantasy & Horror Films. Accessed 2010-09-20. ↑ 'And the Winners Are...' (2010) The Academy of Science Fiction Fantasy & Horror Films. Accessed 2010-09-20.